In 1989, Barry Levinson’s Rain Man picked up Oscars for Best Picture, Best Original Screenplay, Best Director and Best Actor in a lead role for Dustin Hoffman. On Thursday, April 11 at 6:30p.m. 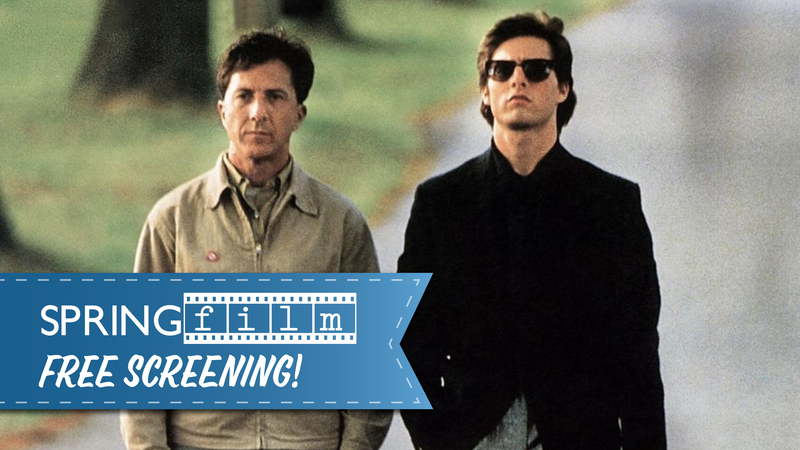 please join us at the Wildish Theater to see the highest-grossing film of 1988, Rain Man. The film follows Tom Cruise as the selfish wheeler-dealer Charlie, who discovers that his multi-millionaire father left his entire fortune to his brother Ray (Dustin Hoffman), an autistic savant who Charlie did not know existed. Needing money in a hurry, Charlie takes his new-found brother on a road-trip trying to find a way to get his hands on his father’s estate and learning more about his brother along the way. As well as winning four Academy Awards the film was nominated in a further four categories, picked up two Golden Globes and was awarded the Golden Bear at the 39th Berlin International Film Festival. Starring Tom Cruise, Dustin Hoffman and Valeria Golino; directed by Barry Levinson; 133 minutes; 1988; Rated R.